Some things change…and some never do. I was an avid journaler as a kid. Journals, diaries, whatever you want to call it, I kept it. I started with a tiny pink one with bears on it that had a lock and key. The entries were of the “Today, I …” sort. In middle school, I moved on to bigger books with no lock, even though the words carried more emotion, drama and secrets. Through high school and partway into college, I filled three more journals, my handwriting improving from those formative cursive-style days to a hurried, but focused combination with print, the color of the ink settling on black or blue only, the stickers and doodles disappearing one by one. My journaling is now more or less this blog, and although I still write about very personal issues, I can’t help but notice the changes over time between those secretive, scribbled escapist entries on paper, and these well-thought out yet similarly emotional typed essays — and the differences. I was reading through the old journals the other night, which I’ve done before, to pull out specific points in my life. I used to mostly laugh at how silly I was about my many crushes, the stupid fights with friends, and the endless lists I compiled of my favorites. But this time, as I read through the entries in late middle school and high school, an overwhelming feeling of sadness came over me. Sadness for the girl that I was, and sadness for the girl that I thought I was at the time. I wasn’t struggling with an eating disorder, depression, or hurting myself physically. But I realized how much I was hurting on the inside…and how much I continued to let others hurt me for so long. Those of you who know me and my story, know of my baggage with some family members. So if that wasn’t enough — the years and years of trying to understand why my father didn’t love me enough, the years and years of trying to understand how to make it work with the man who had become and remains my true father — I spent an insane amount of time and effort trying to make everyone like me. Girls, guys, teachers, adults, whomever. I wanted so much love, so much acceptance, and it killed me every time I didn’t get it. I was trying so hard that I made it worse for myself without even realizing it. And it pains me to think of the things that people might have said about me, because let’s face it, kids are mean to each other in those years. When I look at the relationships in my life now, and what I’ve gone through in the last year, reading about my adolescent years reminds me of who I am, where I’m headed, and what I need. I’m reassured and comforted by the changes I’ve gone through for the better, by the cleaning out of the toxic situations and people in my life, and I’m happy to know that even if EVERYONE doesn’t like me, I have a handful of amazing people that very much do, and that I don’t have to try so hard anymore. I don’t have to be prettier, or thinner, or more athletic, or smarter, talk less or talk more, play soccer or be really good at math. I don’t have to know everything or be everywhere or be everyone. I may have changed a lot over the years, and so have the circumstances and relationships in my life, but one thing will always be the same: I’m still me – just a girl who likes to write and cook, who wants a best friend to share secrets with, parents to hug and cry with, dogs to cuddle with, and a boy to like me in spite of it all. ← How does it make you feel? Thanks for sharing this, Jenna. I think a lot of us realize what you’re talking about. Underneath it all we’re the same people we’ve always been, and want to same things we always did (and they are usually simple, important things). What changes over time is how we feel about ourselves, how much we ALLOW ourselves to get what we want, and how much faith/trust/confidence we have that all we want is available. 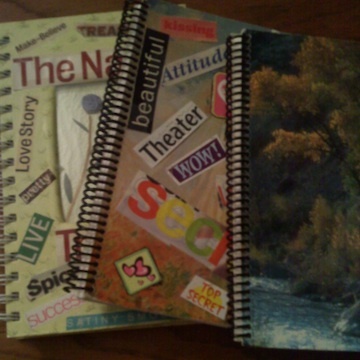 I was never that brave to save old journaling posts from adolescence. I think I save dmy little diary with a key from junior high only. But the stuff from high school I shredded and threw away. It was the saddest point in my life when I felt the most alone. It was too painful to save. I look back on some adult journal entries and some of those are difficult to read. They were when I struggled with my parenting and had no control over how my children behaved. It is part of who I am as a human being. Reflecting makes us understand who we are and how we move forward. Thanks for your post.